Could you try the following version, which includes some DEBUG information. USER_AGENT="Mozilla/5.0 (iPhone; CPU iPhone OS 10_3_3 like Mac OS X) AppleWebKit/603.3.8 (KHTML, like Gecko) Mobile/14G60 (400962928)"
what’s the address 10.8.0.1? Does the system has a vpn connection (tun0)? I did implement some more error checking. @markus7017 weird is that in the last step “Authenticate MobileDevice” it is not producing any output in your test. Looks like the JSON request in that step is not send. If it would be there should at least be some output. 2018-10-13 18:13:11.290 [ERROR] [ertaintv.internal.EntertainTVNetwork] - EntertainTV: Unable to get local IP / MAC address: Diskstation: Diskstation: Name or service not known! Now it worked! I can connect and control the Media Receiver! The only thing that not is working is the “Power On” status. It always showed me that the receiver is “ON”. Is that normal? However, I’m looking for more stable way by processing the local interface list and getting the ip from there. it seems that something is wrong with the OH build environment. Even automatic travis builds are failing atm, so you are not alone with your issue. @hmerk Did you tried the binding? As I remember you still have a MR400. Would be interesting to see if it’s still running. The version in the repo is ok to test. @Mat_Ias did you saw my last reply indicating 404? I am now sitting at my computer to change some openHAB stuff and try the binding. Will post results later this evening. @TF1rst Could you please try this version, it has a revised detection logic (filters tunnel interfaces, v6 addresses etc.). This version has also the fixed key codes. i have one MR400 and one MR401. I am very interested at the binding. If I can try the binding or can support, let me know. Please go ahead a give the last build (see abobe) a try. Start with 401 and the. 400. @hmerk reported problems that the send key doesn’t work. would be helpful if you could supply a direct comparable result. I’m working on the next beta, which includes more key codes and event processing show title information etc., but the release posted above is good for the basic testing. Hi, I have a new version ready to test. To install the binding you need to remove the current thing and re-add it by running a new discovery. OH should keep the channel/item linkage. It includes new channels, some of them are marked as advanced, you need to click on [Show More] to see them. The activation code property has been removed from the binding config (now computed automatically). Most important: The binding listens to the stb events. 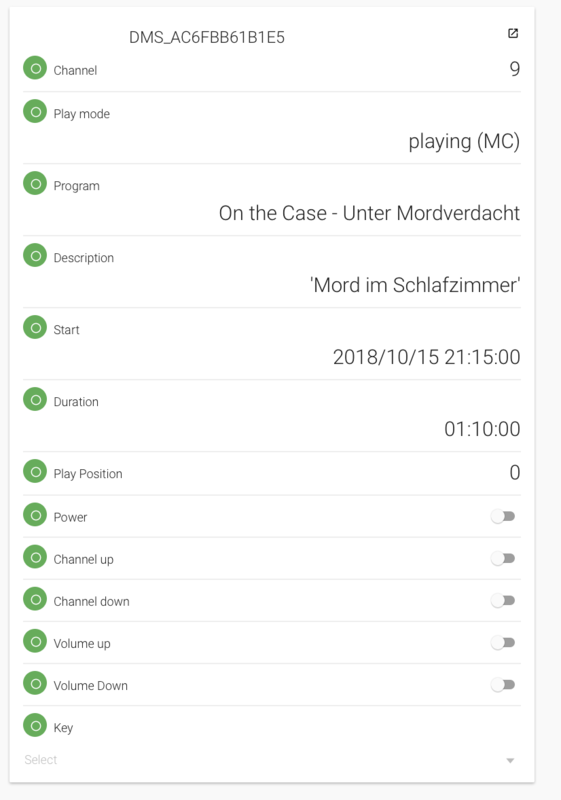 So every time you switch the program or start a on-demand video the binding gets events and will update the channels. The binding supplies channels for power, chan-up, chan-down, vol-up and vol-down. Those are simplifications instead of sending the appropriate key codes to the _Key item (e.g. “CHUP”). Once the switch is activated the binding sends the keycode and puts the switch back in the OFF position. Using the _Key channel provides access to all keys on the remote. Please give it a try and provide feedback. Can you build a version for OpenHAB 2.3? I think the version 2.4-SNAPSHOT is not compatible with my 2.3 installation. Edit: I will testing with the Version 2.3-SNAPSHOT in the posting two days ago and give feedback in the evening. Can someone tell me how I get to the “User ID”. Unfortunately, I have no FritzBox and with WireShark I get only a GET command. The POST command with the user ID is missing.